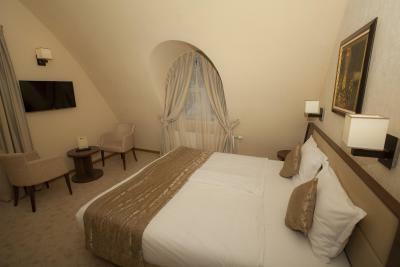 Lock in a great price for Family Hotel Saint George – rated 8.7 by recent guests! Everything. But the location was where I didn't expect. It was quite far from city center. I saw good location stars on this site, but it is really good location for hiking, not going city center. But that was no problem because I went there by car. It's quiet and such a great nature place to escape from the everyday environment, and still close to the city, with a wonderful view! The hotel is in the mountain with a great view over the city, accessible by taxi for about 5 euro from the center. It is very cosy and the food is awesome. Great quiet place to stay if you like being in the woods. I would always choose this hotel for a short escape. It was nice. Needs renovation partially. There should be a swimming pool, but it is under reconstruction. Amazing location and amazing family run hotel . The food is top quality. Amazing value for money. Home away from home with exceptional friendly staff. Will stay every time . The area - up the mountain; good walks. The family and animal friendliness - this was relaxing. Staff pleasant and helpful, food good. Bedroom a good size. Fridge and kettle (and instant coffee etc) provided - very useful. Wardrobe and safe. Good value. 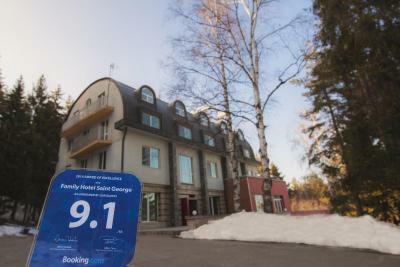 Family Hotel Saint George This rating is a reflection of how the property compares to the industry standard when it comes to price, facilities and services available. It's based on a self-evaluation by the property. Use this rating to help choose your stay! 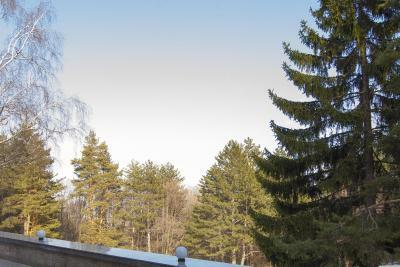 In the heart of Vitosha National Park in Sofia’s district of Simeonovo, Family Hotel Saint George offers rooms with panoramic mountain views. 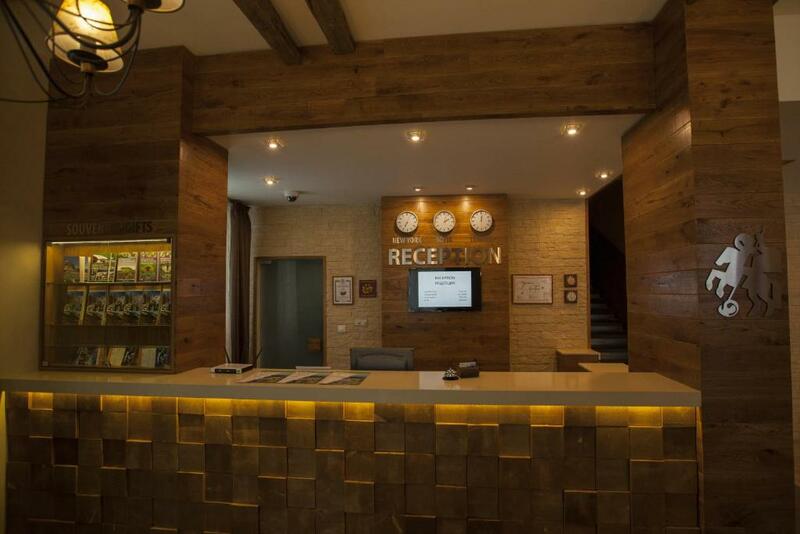 Free Wi-Fi access and free private parking are provided on the premises. Freshly prepared home-style breakfast is available. 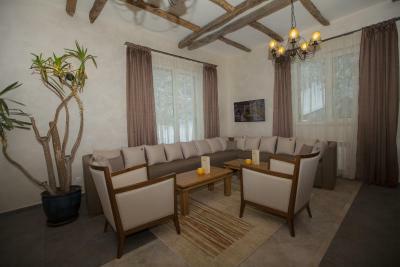 The restaurant has a summer terrace, and serves a selection of traditional Bulgarian as well as international dishes. 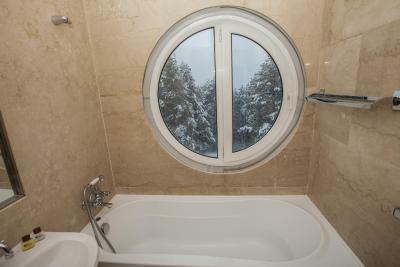 It features a fireplace in winter. The rooms at the family-run Saint George Hotel feature hardwood floors, satellite TV and a private bathroom with shower or bathtub. Some units have a sitting area with a sofa. You can use the on-site sauna and hot tub for a fee. Horseback riding can be organized for you, upon request. 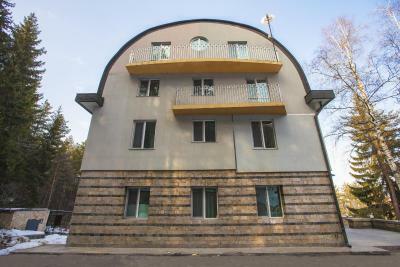 Vitoshko Lale Ski Slope is 11 miles from the property, while Dragalevtsi Monastery is 4 miles away. The center of Sofoa is reachable by car in about 20 minutes. Shuttle service to Sofia Airport, a 30 minute drive away, is offered upon request for a fee. 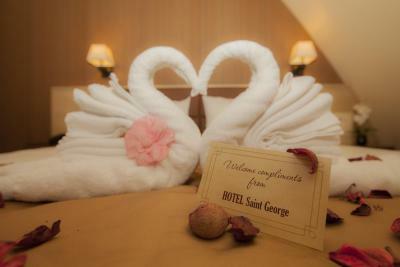 When would you like to stay at Family Hotel Saint George? 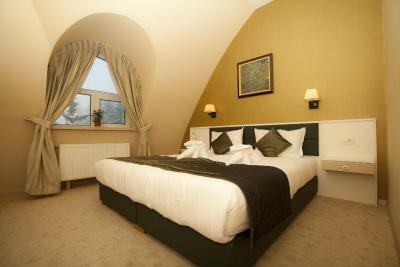 Rooms feature satellite TV and views of the mountains or the city. Some rooms have a balcony. 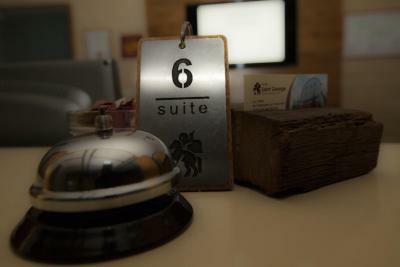 Rooms feature separate living room and bedroom, satellite TV, views of the mountains or the city, and a minibar. Some rooms have a balcony or a fireplace. 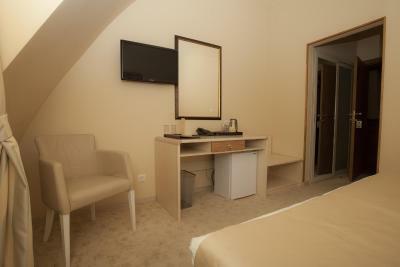 This double room features a mini-bar, a safety deposit box, satellite TV, an electric kettle and free coffee and tea. 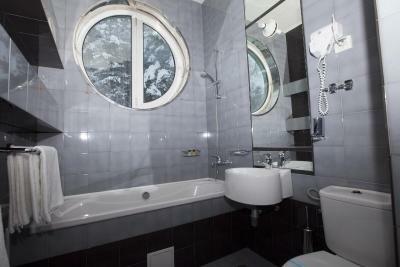 The bathroom comes with a bath or a shower, a hairdryer and free toiletries. This suite features a electric kettle, sofa and mini-bar. 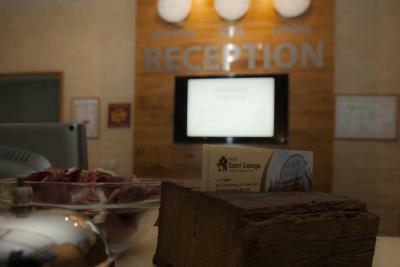 House Rules Family Hotel Saint George takes special requests – add in the next step! Family Hotel Saint George accepts these cards and reserves the right to temporarily hold an amount prior to arrival. Very friendly service staff. Calm room surroundet by forest. Parking infrot the hotel. Menue-breakfast was very good. - If you are coming to enjoy the nature around and just relax, without going to the city multiple times - If you have your own car - If you come during the summer when the weather is perfect, this review doesn't apply to you. The location was a big minus for this hotel especially if you are coming in winter without a car. We were aware of the fact that the hotel was a bit away from public transportation but realized that it was a bit too far off only when we reached there. Taxis dread to even come up here due to the condition of the roads. It's about 1.5km uphill of where normal roads are. It doesn't even show up on the google maps, FYI. Probably with a 4x4, it would have been better. Normally, this is not even a problem if taxis understand where this hotel is or can at least find it on the map. They CAN'T. Unless you call YellowTaxi Sofia since the hotel has an agreement with them. This should be written on the hotel page in my opinion. We were cheated by a couple of taxis we stopped on the roads and what should have been a 15 min drive from the ski lifts to the hotel took us 2 hours fighting the cheating taxis and waiting for the hotel staff in freezing cold to pick us up. ( The family of 5-6 basically do everything in the hotel, so they usually are busy and have no dedicated person to attend to such calls or pick you up asap) We had a bad experience a couple of times until we figured out that the only way is to call yellow taxis from the central line and not stop random taxis on the way. We have been to 20+ countries and never had to depend on anyone to travel from one place to another. This was extremely tiring for us. Though the hotel staff were extremely nice and helpful, it shouldn't have been like this and the guests should know this in advance. 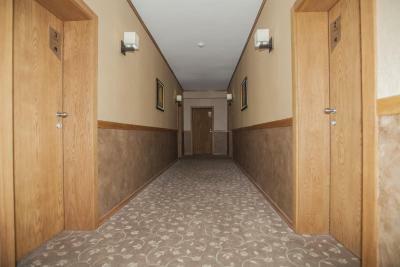 The property is like a chalet run by a family of 5-6 people. They are super good people that cook amazingly delicious food. They were really helpful when asked throughout the stay. 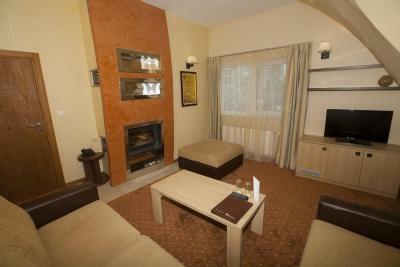 The stay is perfect during summer when you would like to hike around in the forests or nearby vitosha mountains. At winter times you have to be extra careful driving the road to the hotel. There was a little bit of a tobacco smell in our room, we suspect some of the guests might have had a smoke inside before us - this shouldn't be allowed and tolerated. All good. Polite and helpful staff. We came late, but even though the restaurant was closed, they've managed to serve us some hot soup for dinner, which we appreciated. 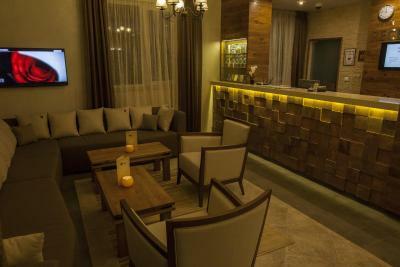 One of our favourite hotels to stay when we're in Sofia and we highly recommend it if you're looking for a place to stay in the capital. Staff were really friendly and nice .had a great time at the mountain with my friends ! It is very quiet and nice place. The road to the hotel might be tricky to drive in winter times, unless you're not driving a 4x4. The hotel seems a bit understaffed as one employee was attending the reception and the restaurant. 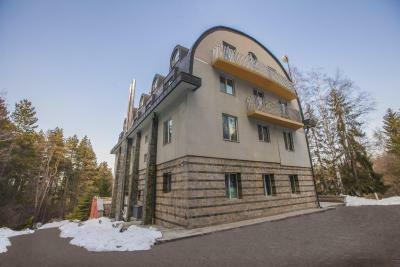 Nice and quiet location in the middle of a pine forest in the outskirts of Vitosha. The hotel and the rooms are well decorated in a "mountain hut" style, with lots of wood and stone. 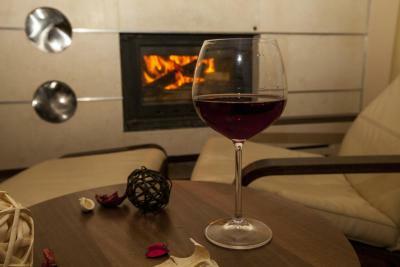 The restaurant is cosy with a big fireplace. The menu is simple but the meals we ordered were tasty. We were offered 4 types of breakfast in the morning. I recommend trying the fried bread slices with jelly and white cheese. Overall it is a nice, cosy and quiet place to stay outside of Sofia and at the same time very close to the major city arteries. There was this odd smell coming from the toilet. It is actually the only thing that doesn't make this entire sleepover a 10. We loved the friendly personnel working there. It was nice and warm. 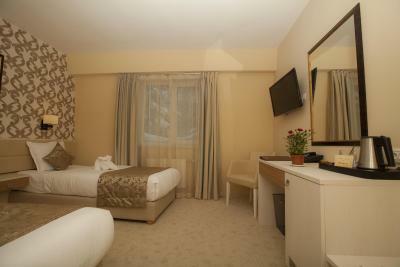 The hotel itself is in Vitosha, which means clean air and a beautiful look towards the city of Sofia. 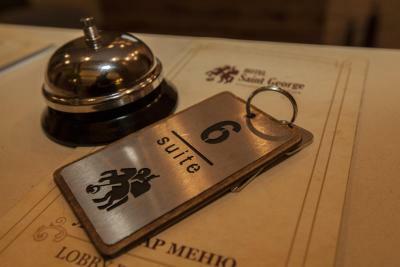 1st of all the St George family hotel in Sofia is less of a hotel as we all know them and more of a challet . Keeping that in mind and during the snowy season get ready to feel like you are acommodated somewhere in the Swiss alps because the surrounding environment is 100 % alpine - a spruce foresty mountain side a.k.a a total magic when its snow white . 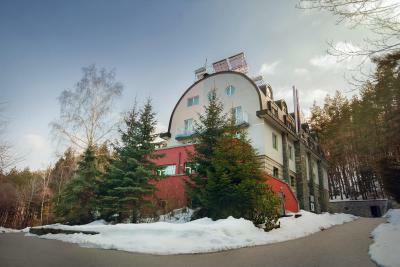 The construction , firstly built during the cold war era and renovated later by the current owners , is a 3 floor premise with a big living room - restaurant on the ground floor having a 180 degrees view on the forest due to its glass walls . There is , of course , a fire place and uppon request you can order pretty much everything - just speak on time to Martin or Krasimir ( the owners that are allways present ) and they will happily fix it for you at a very logical price . All dishes I had there were great ! On the upper floors there are rooms and 2 swites on each floor side . 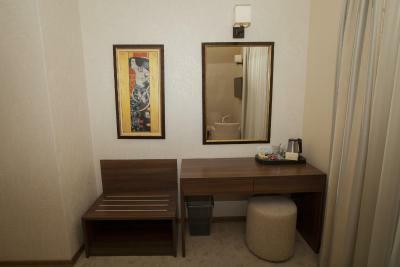 The rooms are clean , bed is good , maybe a problem with the blankets but you can ask for more - the suites are a room with a bigger bathroom and a second living room with a fireplace . During my stay there the only ( real ) problem I had was the transfer from the villlage down the hill up to the hotel and I explain next . The building as is located some good 400 metres abobe simeonovo ( small suburban area in the outskirts of sofia ) can only be reached through the classic snake alpine road that is around 2.000 m . NO NORMAL TAXI CAN MAKE IT UP THERE AT WINTER TIME , I TRIED MANY TIMES WITH DIFFERENT CARS AND THE RESULT WAS ALLWAYS THE SAME : STUCK ON ICE AFTER THE EXIT OF THE VILLAGE . ONLY REAL 4X4 CARS CAN EASILY MAKE IT UP THERE AND KEEP THAT IN MIND IN CASE YOU ARE IN SOFIA CLUBS @ 3:30 am PREPARING YOUR SELF FOR A WARM BED AFTER A TAXI RIDE !!! So if you want to go to Sofia you have to preplan it with the guys from the hotel so they come and jeep you up at a fixed time free of charge !!! Recommended : YES ! Will go again : YES ! During cold season they need more care for the road, more heating and more light in the rooms. The location is perfect within the mountain.